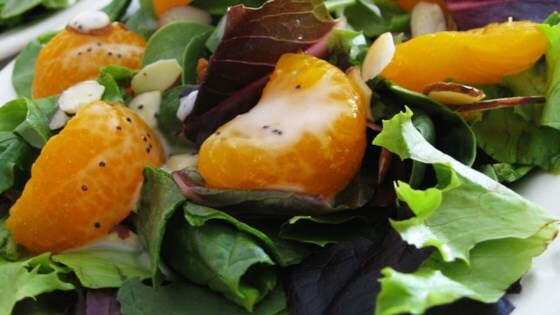 "A colorful mix of baby greens, mandarin oranges, and almonds is topped with a sweet and tangy poppy seed dressing." Make the poppy seed dressing by whisking together the creamy salad dressing, vinegar, sugar, and poppy seeds; set aside. Arrange the spinach leaves, mixed salad greens, oranges, onion, and almonds onto individual salad plates. Drizzle with poppy seed dressing to serve. This recipe is great. I have made this for years although instead of mandarin oranges I use strawberries. Maybe next time I will try the oranges. This was a terrific recipe!! My family loved it. I did make one modification though and used less vinegar. Everyone loved it. This will definitely be a repeat for me!! We really liked this salad. I used fresh clementines instead of the mandarins and added mushrooms. I had quite a bit of dressing leftover, so i'll cut it by 1/3 or so next time. This is fantastic! I used all spinach and I subbed walnuts for the almonds because of an almond allergy- I brought it to a party and everyone ate it- there wasn't anything left in the bowl! I've made this recipe many times, I add strawberries as well and crumbled goat cheese............it turns out excellent! !